The MCU has given us a bevy of characters. The alienated, lonely Captain America, the arrogant, yet brilliant Iron Man, and the angry, but still compassionate Hulk. All of these characters in one form or another were known by fans before they hit theaters. When you grow up with superheroes, you learn the basics fairly quickly. Spider-Man may be the first Marvel character people remember watching, and Batman or Superman may be the first for DC. As we get more acquainted to the universes, we learn more about different characters. The X-Men cartoon and comics come to mind. The Justice League cartoon is a great resource for anyone with questions about DC Comics. But with all of these characters and all of these stories, some are bound to get lost in the fold. Black Panther was one of those heroes for Marvel. I’ll be the first to admit I wasn’t extremely knowledgeable about Black Panther. I knew of his suit, his country, how smart he was, and his origin story. I couldn’t pull any stories out of my head though regarding him. I didn’t know what defined him or what he was truly about. Some people I know had no idea who he was. When I told one of my co-workers that Black Panther was going to be in Civil War, he said, “Why are they putting a racial hate group in a Marvel movie?” He was dead serious too. Going into Civil War, I was beyond excited to finally see T’Challa in action. I knew mostly everyone would be impressed with what they saw. Black Panther in Civil War was great! Absolutely fantastic. We got to see the death of his father, and he underwent strong character development by the end of the movie. I knew he was brilliant, but for a while I was beginning to think they weren’t going to show his intelligence. The entire movie he was trying to take Bucky’s head off. With good reason obviously, but I wanted him to realize that Bucky didn’t do it. Sure enough, he has a beautiful moment where he realizes how vengeance almost broke him. He said that it had consumed him. He said it was also consuming Iron Man and Cap as well. Then, he prevents Zemo from taking his life after he says vengeance will no longer consume him. All of this came during a Captain America movie! His story was weaved in beautifully and it didn’t feel rushed at all. After Civil War I immediately went to my local comic shop to pick up the current run of Black Panther. The thing I truly love about comics is there is so much to learn. I’ve never found comfort in being “too smart” or “too good” to learn something new. When you become content is when you begin to fall behind. Comics provides you with so many ways to learn and shape your mind. The first two issues of Black Panther can be summed up in one word. Serious. It wasn’t necessarily dark in tone, but T’Challa deals with the most of almost any superhero. The focus of this run is Wakanda. Past events from the Marvel comics have completely destroyed the great country. Civil War has been brewing for quite some time now and that’s where we enter the story. This is a story about T’Challa’s struggles as a king first and foremost. He really isn’t a superhero. He saves people sure, and fights for the good side, but he must protect his people first. 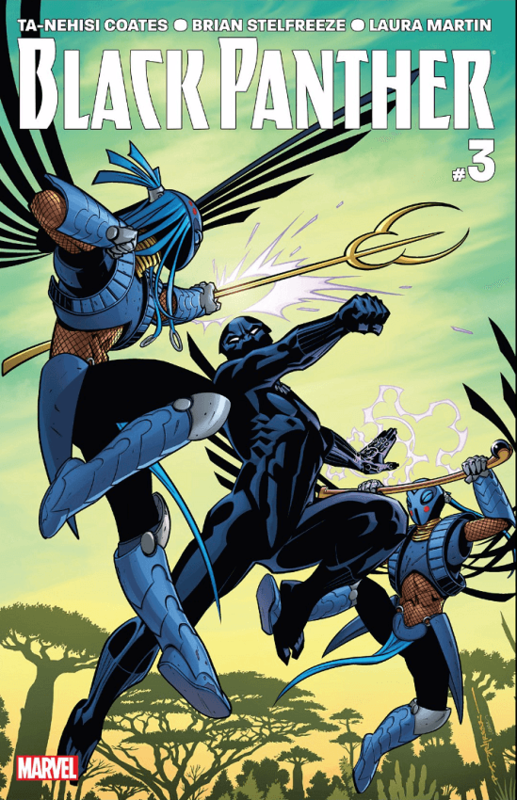 The first two issues introduce us to two of Black Panther’s former guards who have disbanded. They call themselves the Midnight Angels. Their goal is the same as T’Challa’s. To achieve a safer Wakanda for all but by any means necessary. The guards are women, so they’re main concern focuses on liberating women from the clutches of brutal warlords. Black Panther’s narration in the first two issues are great. The writer really digs deep into his soul. These problems are affecting him in ways they shouldn’t be. A sense of confusion definitely hangs over Black Panther in the first two issues. All of this, and my re-ignited love of the character made my expectations for issue #3 very high. Just like with the first two issues, issue #3 dives down into some real issues in regards to responsibility and leadership. It starts off with Tetu, one of the main people resisting Black Panther’s rule. He recites somewhat of a poem-style speech about the old Wakanda. We see this argument a lot in today’s world. How much technology do we need? Is there such a thing as too much technology? Will technology be our downfall? This question is almost impossible to answer, seeing as how most of us won’t be alive to witness the complete evolution of technology. But still, in our society today we see people debating about the harmful influences technology has on us. Parents and elders from older generations are known for their dislike of certain technology, like social media. They believe kids don’t interact anymore with each other. This lack of interaction causes kids to be less active, which some think leads to an unhealthy lifestyle. On the other side we have our technology gurus. They assure us that social media and other methods of technology, when used correctly, can enhance the human experience ten-fold. It’s a debate that has always existed, but is even more relevant with the numerous amounts of improvements our society has made in that field. Anyway, Tetu talks of the time when the natural African sunlight would wake you up. You then would repay the land by harvesting crops and taking care of it. The land would then give you food. The panels here do a good job explaining what Tetu is talking about. The next page Tetu begins to describe how Wakanda has changed. There are images of an enormous city being built and workers walking towards it. We also see invasions. Multiple invasions. Doctor Doom is clearly pictured here (he tried to invade/capture Wakanda while T’Challa was away.) Tetu then says “Flesh laughs at my charred and beaten frame. Discarding me in the mud, burning me up in flames.” I believe he’s talking about the new order in Wakanda. They see a man who doesn’t contribute to this new era so he is looked down upon like a savage, mainly because of his “charred and beaten” frame. Tetu then says that this new order has become lazy. They do not and have not respected the old way for quite some time now. He says that if only the new order would only listen, they would hear the displeasure. They would feel the pain the country is in. We then see that Tetu actually has abilities. He seems to be connected to the land in a way no one can really understand. The next part of the issue gives us T’Challa. The art here is amazing. I love how you can see the sadness in his eyes when he talks even with the suit on. He is so confused right now and he feels like every decision he makes is a bad one. He admits to feeling lost when he’s talking to his step-mother. She reminds him of how strong he is. She tells him he’s not lost, but just the opposite. She wants him to use his heightened senses to find a way out of this mess. This is a good moment because all heroes need someone who believes in them. I like that Black Panther has this character so he isn’t completely miserable all the time. The Midnight Angels get a scene next as they realize they might be doing more harm than good. Aneka says a powerful line where she says, “We have proved we can punish the guilty. But can we protect the innocent?” The statement rings true for a lot of uprisings throughout history. It’s easy to punish those you deem “guilty” but what about establishing order. Order doesn’t involve bombing and looting a place screaming your battle cry. The Midnight Angels are finding this out in the early stages of their rebellion. We then get to see T’Challa’s sister, Shuri. She died protecting the country, but she isn’t really dead. She travels the Djalia, the plane of Wakandan memory. Black Panther was referencing it in Civil War I believe when his father died. Here, we get more of the same message that Tetu was preaching. Shuri is with a spirit that resembles her mother. The spirit tells her that she must learn the old ways of Wakanda. The spirt tells Shuri that the metal age has eroded tradition. Shuri doesn’t care too much. She reminds the spirit that she is a queen. The spirit simply asks, and I’m paraphrasing, “Where is your kingdom now?” This is a brilliant narrative on the true value on material things in our world. All that power Shuri had in life. Now she has lost it all, and is powerless in death. The spirit reminds Shuri that she has become lost in the ways of the metal age. That the kings and queens before her knew nothing of the Djalia. The issue then closes out with Black Panther hunting down Tetu. His narration is bone-chilling. I hear Chadwick Boseman’s voice now when I read these comics. Black Panther calls Tetu a traitor. Tetu then gathers some sort of energy from the spirits. He restrains Black Panther. Then, he lets him know that there will be a day where Wakanda doesn’t need a king. That one day Wakandans will rule the country again. Lastly, we see Aneka running through the woods. She’s being chased by some kind of machine working for Lord Mandla. They bait the soldier however, and lead him to their base. Before the issue ends, we are reminded of Tetu’s message at the end. We see a man and a girl being washed by the African rain. I’m loving this run so far. The art looks better here than it did the last two issues. I love how we aren’t really getting a stereotypical superhero story here. I don’t even believe we’re getting a stereotypical ruler story. I don’t know how often I’ve read a story about an honest, just ruler who I thought was wrong. Black Panther isn’t necessarily wrong here, but objectively, I understand the frustrations of the Midnight Angels and Tetu. They feel betrayed by the new order. They feel unsafe. All they want is for Wakanda to go back to the people, because the rulers don’t respect them or the history of Wakanda. From Black Panther’s perspective, he’s done everything he can for his people. When other obligations call, he answers them. He put the best people in charge of trying to maintain order in Wakanda while he was gone. With or without him, the country probably would have suffered. He just wants the citizens to understand that he only wants the best for them. This narrative is definitely relevant because of Africa’s abundance of resources in real life. Africa for years was plagued with imperialism and colonization. Its natural resources were stripped away and many of the natives were against assimilating to French and British culture. Now, some areas in Africa have been overrun with unimaginable violence. War lords control the governments and radical groups like Boko Haram kill innocents every day. It’s a sad reality. One that I think Black Panther wants to avoid dearly. Both sides have valid arguments. I hope Black Panther can resolve the issues before something horrible happens to his people.